Welcome to Newport, Rhode Island, where the summers are one long sunset-drenched cocktail party and the winters are best spent cozied up by a roaring fire, preferably with a Hot Toddy and an open bar ta﻿b. While this pretty New England coastal town steeped in history is deserving of a visit any time of year, I happened to come during its climatic sweet spot­­. Neither the on or off season, it’s a blink-and-it’s-gone period of bright, sunny days punctuated by cool, crisp nights. Surfing, sailing, and stunning dusk skies keep the best parts of summer alive, while wood-burning stoves and pumpkins on doorsteps imbue it with the first feelings of fall. The term “sweater weather” was probably invented here, or more accurately, “sweater-draped-over-the-shoulders weather.” In fact, preppy Newport style harkens back to the days of JFK and Jackie Kennedy, who vacationed and were married here. Think stripes, khakis, crisp denim, scarves, windswept hair, and lots of camel-colored layers. It’s casual sophistication, with an emphasis on sophistication. Lucky for me, my fiancée Chauncey was born and raised here, so I was given an insider’s tour of the best local-approved spots to visit year-round. Drive it, bike it, or jog it, this 10-mile route runs along the ocean and is peppered with some of the most jaw-dropping waterfront properties on the East Coast. This diminutive shop (also considered their flagship boutique) is filled with all-natural, non-toxic skincare products made with organic herbs, flowers, oils, and grains. A thoughtfully curated store carrying covetable objects and one-of-a-kind art from emerging artists. Come for the award-winning clam chowder, stay for the waterfront views (and their famed mudslides). A Newport institution, this nautical-themed eatery has been around since 1967. This is comfort food at its best. Their handmade burger is fresh, juicy, and downright delicious. If you’re feeling extra hungry or hungover (a distinct possibility in Rhode Island’s drinking capital), order the slaw dog as a side. I spotted this cookbook while halfheartedly perusing a cluttered vintage store called Armory Antiques Marketplace on Thames Street. Stacked in a neat little pile on a distressed wooden table amid nautical curiosities, I was drawn to its handwritten cover. 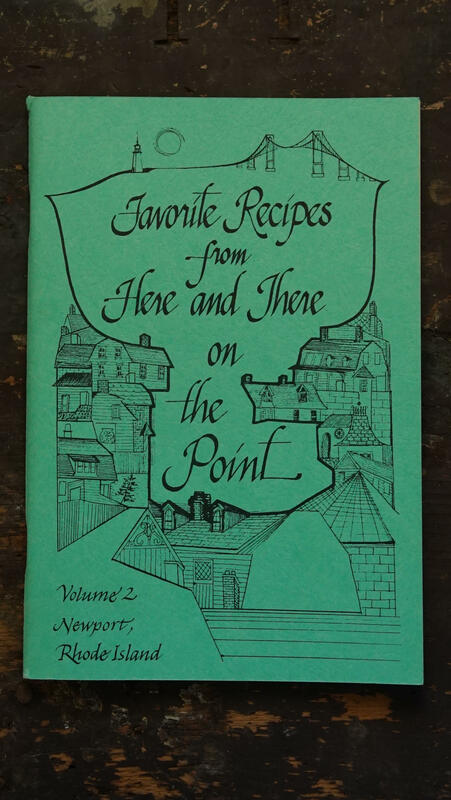 Filled with secret recipes from old Newport residents and historic local establishments located in a small area of the city called “The Point,” it was one of those special discoveries that reminded me why it is indeed worth it to peruse cluttered vintage stores after all. The Pitts Head Tavern Oyster Stew stood out, perhaps mostly because of its namesake. After some research, I learned that the tavern, built in the 1700s, was originally a beloved coffeehouse and then later served as a recruiting office for the Majesty’s Army during the British occupation of Newport. After being moved several times, the building ended up on Bridge Street in the 1960s where it still stands today under private ownership. 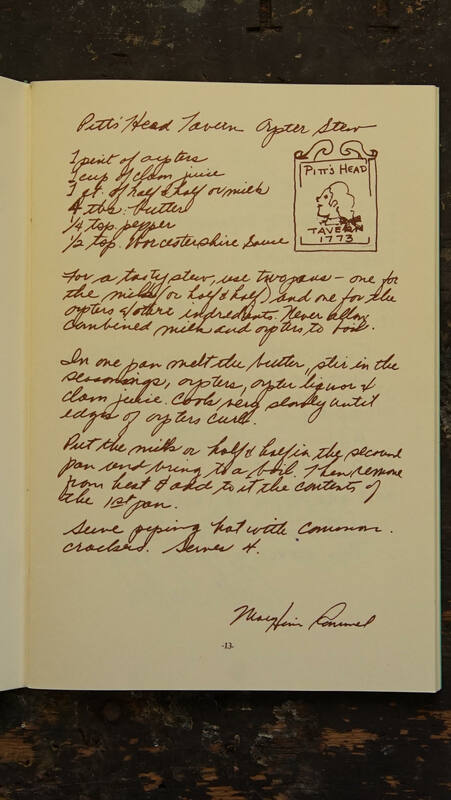 So while the tavern itself is long gone, lucky for us, it’s tasty stew recipe lives on.